Choose between standard iLIFT switch or Cruise Control Module. Cruise Control Module adds device that allows cruise control switch to be used when cruise control system is not active. Not recommended for use with ECUs that use the cruise control switch for map switching. 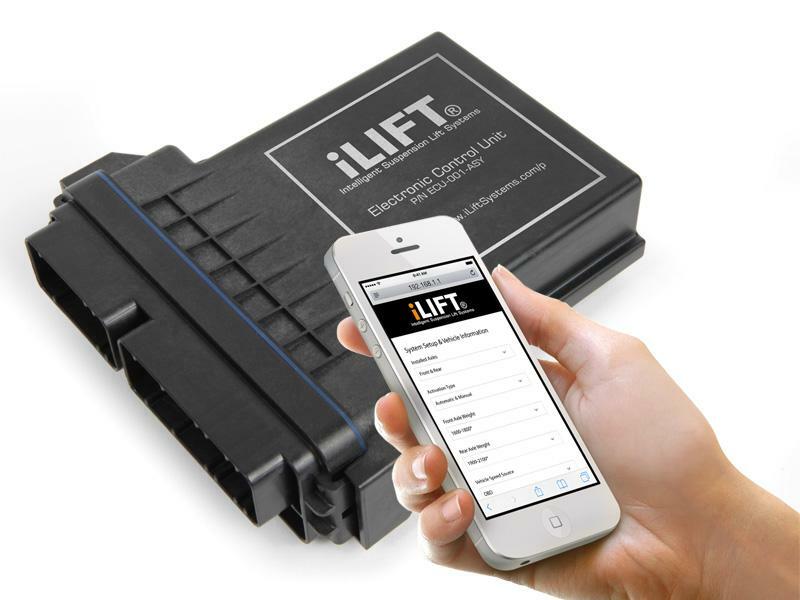 The iLIFT® system is the most advanced and robust suspension lift system on the market, with the unique capability to operate automatically, without the need for a driver to press a button to raise their vehicle. By rapidly raising the vehicle manually or automatically, the lift system eliminates vehicle damage from scrapes on speed bumps, steep driveways, or from other road obstacles. Raising the vehicle also results in increase passenger mobility by allowing the driver and passenger to more easily enter and exit low vehicles. 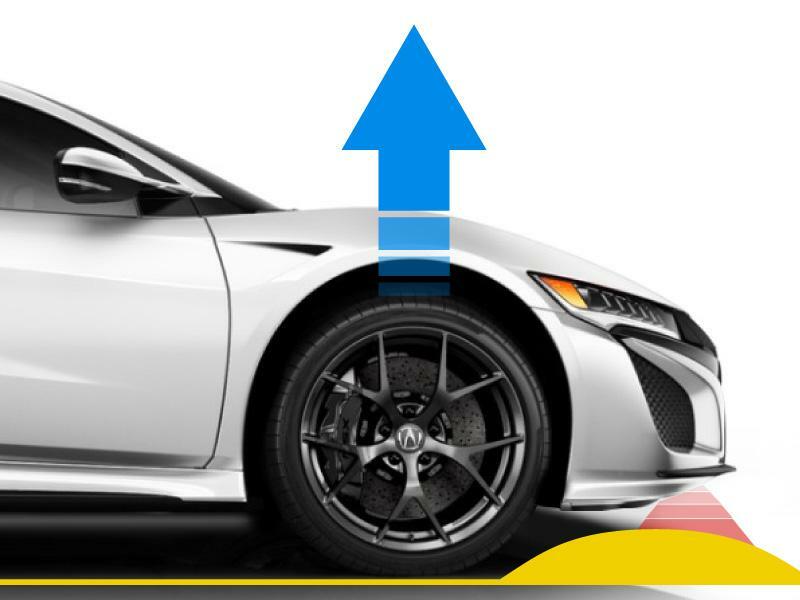 Featuring patented actuator & seal technology - the iLIFT Suspension Lift System lifts your car faster with smaller, more compact components compared to any other system on the market. The intelligent iLIFT ECU constantly monitors system parameters including system pressures to optimize system performance for your vehicle. Use wifi to easily configure your system wirelessly. Environmentally sealed enclosure means the ECU can be mounted in or outside the cabin. 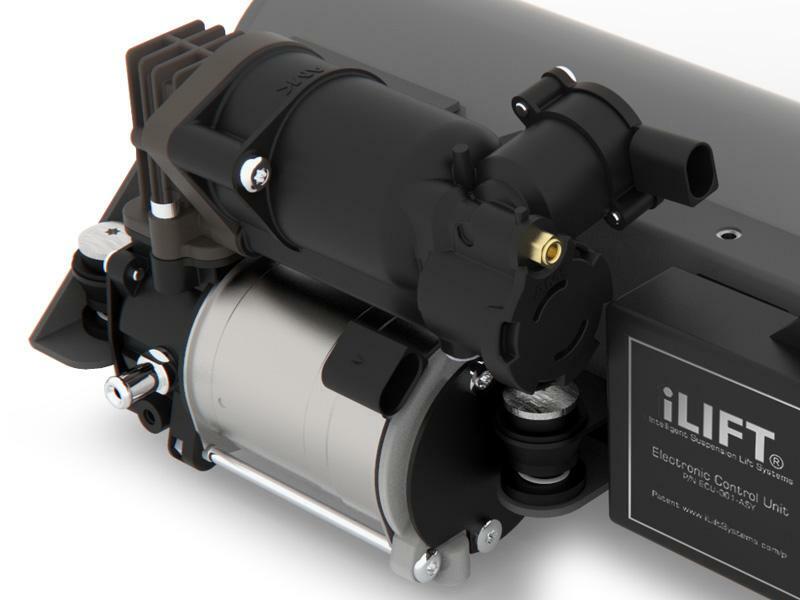 The iLIFT Suspension Lift System uses high quality, OEM-grade components like the German-made OEM-quality air compressor. 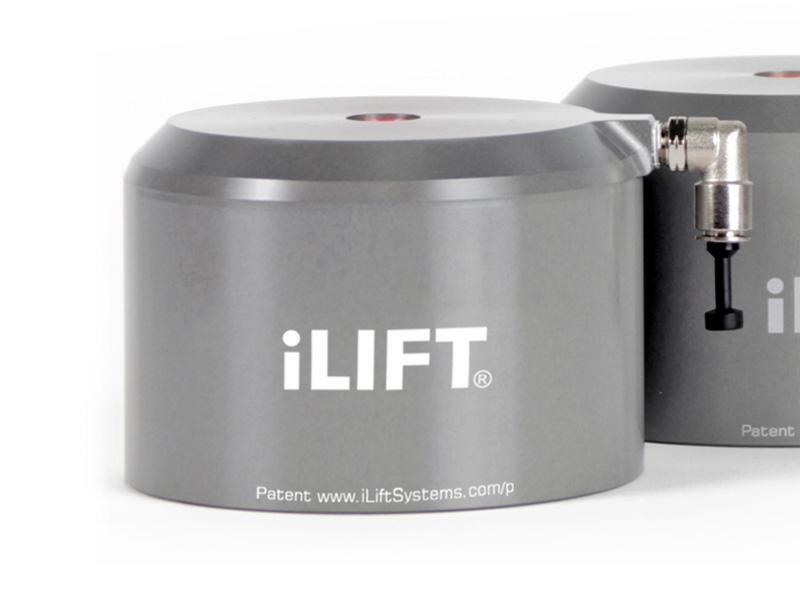 The available patented iLIFT Automated Sensors allows the iLIFT Suspension Lift System to automatically lift your vehicle when an obstacle is detected. Optional Adjustable coilover threaded sleeves & perches: designed to allow the factory shock absorbers to work with iLIFT – allows factory or (when four wheel system is purchased) ride height lowering up to 1.25″. See “options” for more details. Quarter-panel-mounted air compressor: hidden mount in quarter panel. Trunk-mounted air tanks: compact components maximize available trunk space. Optional Cruise-signal module: patented use of factory cruise control switches to raise and lower vehicle when cruise control system is not in use. See “options” for more details. iLIFT Systems adjustable coilover threaded sleeves & perches: allows factory or (when four wheel system is purchased) ride height lowering. Optional cruise control module allows the use of the factory cruise control switch to raise and lower vehicle when cruise control system is not in use. The iLIFT Suspension Lift System can be configured to lift the front suspension or both the front and rear suspension. Lifting the front of the car protects the front bumper and spoiler – typically the parts most prone to damage. Cars with very low ground clearance, or with low rear overhanging diffusers and exhausts can further benefit from lifting both the front and rear. The iLIFT Suspension Lift System can be activated with a switch to raise and lower the vehicle (with either a factory switch or the included rocker switch). Optionally, sensors can be added to provide automated raising and lowering of the vehicle. This patented feature uses advanced proximity sensors that are constantly monitored by the ECU to raise the vehicle when an obstacle is detected. The vehicle will lower once it is detected that the obstacle has passed. This system is activated whenever the vehicle is driven under 25 mph. Automated systems can also be activated manually. Front systems include 4 sensors. Front & rear systems include 6 sensors (the rear pair can be installed along the side of the car for situations like when the vehicle is stopped over a speed bump). The iLIFT Suspension Lift System is compatible with most aftermarket coilover shock absorbers. 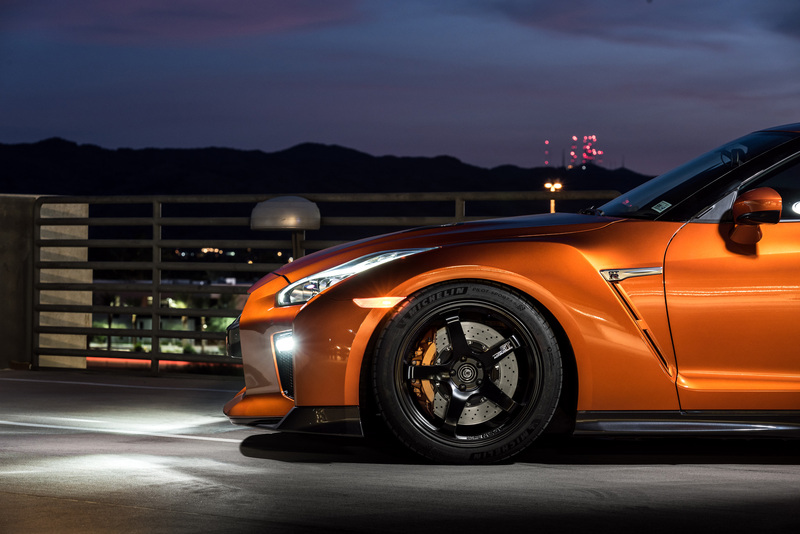 KW Variant 3, JRZ, and Ohlins tested. Contact us for others. In addition, the system is compatible with factory shock absorbers with the optional coil over height adjustable mount & spring kit. This kit includes lightweight threaded body sleeves and perches which allow you to adjust the front ride height to factory setting (for front only systems) or set the ride height to factory or a lowered ride height on all four corners (for front and rear systems). The kit also includes high quality factory-spring-rate Swift springs. The iLIFT System can be activated using the factory cruise control switch to raise and lower the vehicle when cruise control is not active – a patented iLIFT feature. This feature may cause aftermarket engine management systems that use the cruise control switch to switch maps. The standard rocker switch may be a better option for these systems. Factory (requires optional coil over height adjustable mount & spring kit). KW Variant 3, JRZ, Ohlins, and other aftermarket coil over shock absorbers – available top mounts may be required – please inquire.